What Day Of The Week Is May 11? 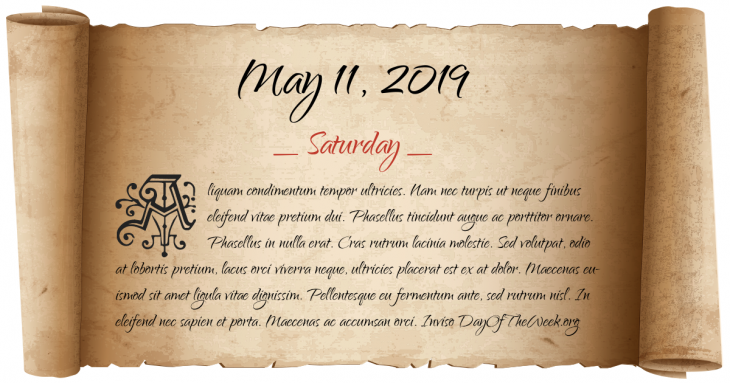 May 11, 2019 is the 131st day of the year 2019 in the Gregorian calendar. There are 234 days remaining until the end of the year. The day of the week is Saturday. The Ōtsu incident: Tsarevich Nicholas Alexandrovich of Imperial Russia (later Nicholas II) suffers a critical head injury during a sword attack by Japanese policeman Tsuda Sanzō. He is rescued by Prince George of Greece and Denmark. The Academy of Motion Picture Arts and Sciences is founded. The 1953 Waco tornado outbreak: an F5 tornado hits downtown Waco, Texas, killing 114. The Lubbock Tornado, a F5 tornado, hits Lubbock, Texas, killing 26 and causing $250 million in damage. After the aircraft’s departure from Miami, Florida, a fire started by improperly handled oxygen canisters in the cargo hold of Atlanta-bound ValuJet Flight 592 causes the Douglas DC-9 to crash in the Florida Everglades killing all 110 on board. India conducts three underground atomic tests in Pokhran to include a thermonuclear device. Who were born on May 11?